After last November’s election, we expressed our concern about unique threats posed by the new administration to core institutions of our democracy and to academic freedom. In the months since, we have seen these threats begin to unfold. Faculty members are being targeted and harassed, the freedom to join together on the job is in jeopardy, and producers of independent thought and knowledge, including faculty, scientists, and journalists, are threatened. The academic year has begun with a spate of racist incidents on campus, another travel ban aimed primarily at Muslims, the decision to end the DACA program that grants residency to many of our students, and, just last Thursday, a decision by the Supreme Court to take up a case that could strip workers in unions of rights. We believe that democracy thrives on dissent, critical inquiry, free speech, and free research. And that means that we must do more than witness these events; we must resist them. That’s why we invite you to check out our One Faculty, One Resistance campaign. The AAUP is the voice of the profession. As such, we’ve been speaking up for academic freedom for more than 100 years. And in these troubled times, we’re doing it with renewed urgency and vigor. 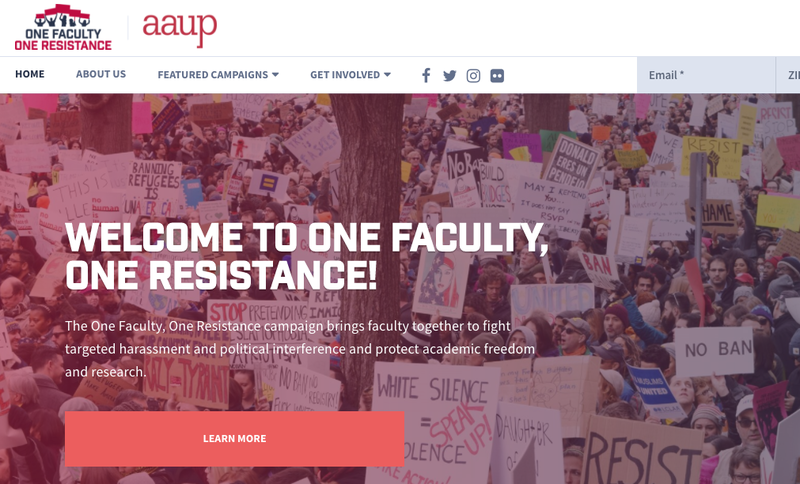 We’ve created a central space for our campaigns and materials related to these threats– materials to help you fight against targeted harassment of faculty and for the right to teach and conduct research freely, and to resist political interference and litmus tests in higher education. Take a look around and share news of the campaign! A powerful resistance requires collective action and voice. Click here to share. Categories: announcements | Tags: academic freedom, DACA, one faculty one resistance, travel ban | Permalink.